This is actually my favorite conversion so far from Generations or really ever. 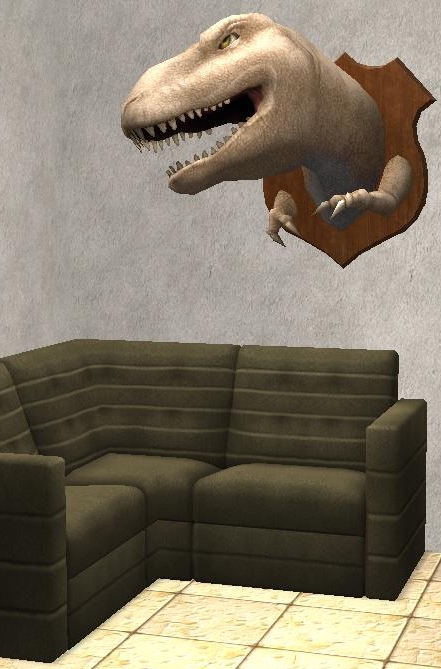 It's The Sims 3 Generations T-Rex head wall hanging for The Sims 2. I'm really very proud of the texture because Sims 3 textures just give us pretty much bucket fill grey (most of the texturing in The Sims 3 is done by players) when you convert a Sims 3 texture for Sims 2 you have to make your own, so I got very creative with it, and I love the way it turned out. Poly count believe it or not is only 986. I hope you enjoy it as well.